* Micro-dot surface reduces friction, leading to a smoother feed rate and cleaner cuts. * Provides great visibility and is strong enough to support even the largest routers. 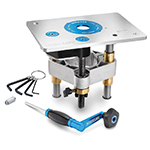 * Package Includes: HPL Table Top, Rockler Fence, Router Lift FX and Steel Stand. * Ultra-flat, low-friction surface that won't warp, dent, scratch or delaminate. * Pro Phenolic table top is ultra - smooth and highly durable. * Package Includes: Phenolic Table Top, ProFence, Router Lift FX and Steel Stand. * Houses virtually any router on the market with large 8-1/4'' x 11-3/4'' router plate opening. * The largest, flattest, most durable router table on the market. * Package Includes: Cast Iron Top, Bench Dog Fence, Bench Dog Pro Lift and Steel Stand. * Package Includes: HPL Table Top, Rockler Fence, Phenolic Router Plate and Steel Stand. * Package Includes: Phenolic Table Top, ProFence, Aluuminum Plate and Steel Stand. * Package Includes: Cast Iron Top, Bench Dog Fence, Aluminum Plate and Steel Stand. * Package Includes: HPL Table Top, Rockler Fence and Router Lift FX. * Package Includes: Phenolic Table Top, ProFence and Router Lift FX. * Package Includes: Cast Iron Top, Bench Dog Fence and Bench Dog Pro Lift. * Package Includes: Phenolic Table Top, ProFence and Aluminum Plate. * Package Includes: Cast Iron Top, Bench Dog Fence and Aluminum Plate. * HPL Router Table Top Only. * Phenolic Router Table Top Only. * Cast Iron Router Table Top Only.